High schools all across the country are holding graduation ceremonies this month. It’s the last time most seniors and their classmates will all be in the same place at the same time. Most will hear speeches from the valedictorian, high school staff, and maybe someone from the community. All will probably share an inspiring message but it might not necessarily be practical advice. That’s where I come in! Here are some nuggets of graduation advice I wish I would have gotten before heading off to college. 1. It’s great to make new friends… but don’t forget the ones who were with you all through grade school and high school. I wish I had stayed in better contact with my high school friends. Facebook and Twitter make it easier to keep in touch today than when I was in college. 2. I know you’re getting away from home (and that’s great) but don’t forget where you came from. Go back and visit every once in awhile. As a bonus you can do laundry! And be sure to visit your grandparents. 3. Don’t save all your laundry until you go home and don’t try and do it one load at a time in the dorms. Do it at a laundromat. Figure out when the off time is and you’ll be able to do several loads at the same time. Plus, you can study while you wait. 4. Try not to schedule any classes before 10am on Mondays. This will give you extra time if you’re coming off a rough weekend. 5. Try not to schedule any classes after 3pm on Fridays. This will get you a jumpstart on the weekend. 6. Work study is great… but you’ll make more money and probably have more flexible hours if you get a part-time job off campus. 7. There will be great food at the cafeteria but you don’t need to eat it all. 8. Stay active. Join an intramural team. Utilize the gym and workout facilities on campus. 9. Don’t skip class! Do the math and see what each class costs. Not for the semester but each individual class period. It’ll make you think twice about skipping. 10. Take advantage of everything your college provides. Your tuition covers more than just school. There are plenty of other activities that as a student you can attend for no extra cost. Go to sporting events, plays, vocal performances, lectures, etc. Get a calendar of events from the campus activities board. 11. If you’re a person of faith attend worship regularly. Many campuses have special services just for students. There are plenty of temptations at college. Church will help keep you grounded. 12. Have a budget, balance your accounts, and save money! You’ve got the benefit of years and years of compound interest. Use it wisely. 13. Find a balance between work, study, and play. Work hard and study… but don’t forget to have a little fun too! 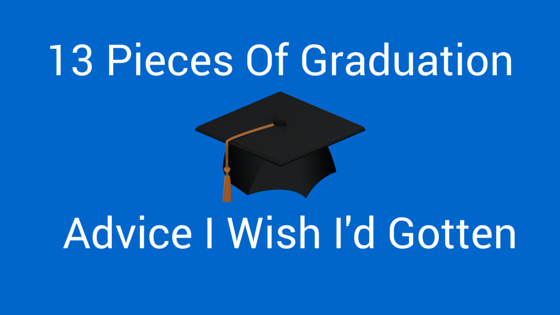 What advice do you wish you would have gotten at your high school graduation? This song has always been a favorite of mine… and contains some great advice too!